Let’s face it, the postcards don’t always tell the full story. I am here to be honest with you about Leiden, and frankly it’s not all as pretty as you may think. There are in fact parts of Leiden that you may never see, hidden away behind railway tracks and up blind alleys. There are kindergartens in the burbs, there are hairdressers. I think even electricians and factory workers can be found here. That’s right! There are actually people who live here who aren’t even university students!? I know right?! Imposters! But for the true integrationists among us, I feel The Leidener would be doing a disservice if it didn’t mention them. 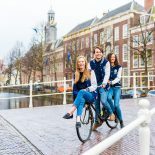 It’s not like you’ll ever meet these people, it’s not probable that these fun-loving Dutch citizens will impact your time here all that much, but they are here, and their story deserves to be told. Where can you find them? I’ll tell you where. Between my house and Albert Heijn XL. This is a particular stretch of Leiden of what could probably be described as a council estate, but as I have absolutely no idea if this area is in fact run by the ever-dependable Leidse Gemeente, I’m more inclined to use the more inclusive term ‘housing estate’. In a country that is in fact, the most densely populated in Europe, there’s no surprises that the apartments and houses here are very tightly squeezed together, so much so that they look alot like sausages, or corn cobs. Some of them even display the qualities of corn cobs, their entrances lined with lurid yellow paint, their windows shining brightly with all manner of kitsch trinkets. It is a veritable wonderland for the itinerant magpie or crow, which may be why so many can be found here. not sure where this leaves me exactly…. And so it was that last week, having found my fridge decidedly low on creature comforts (read milk, bread, not much else), that I walked, yes walked, to Albert Heijn XL, that bastion of consumerism you will soon come to know and love. On the way I was delighted with the change of scenery, particularly the massive effort that has been made to spruce up the otherwise dingy surrounds. 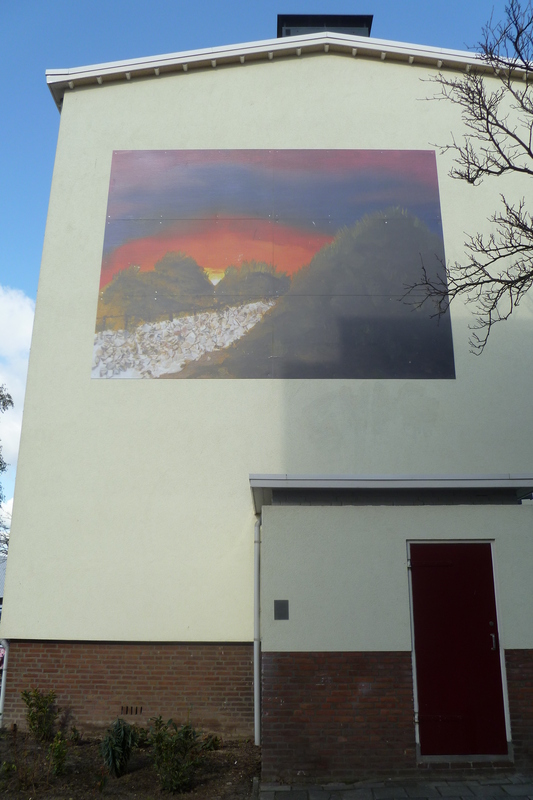 Take, for example, an electricity post house with a massive mural reading ‘Rembrandt’ plastered across the top of it on a hellish yellow and black background. 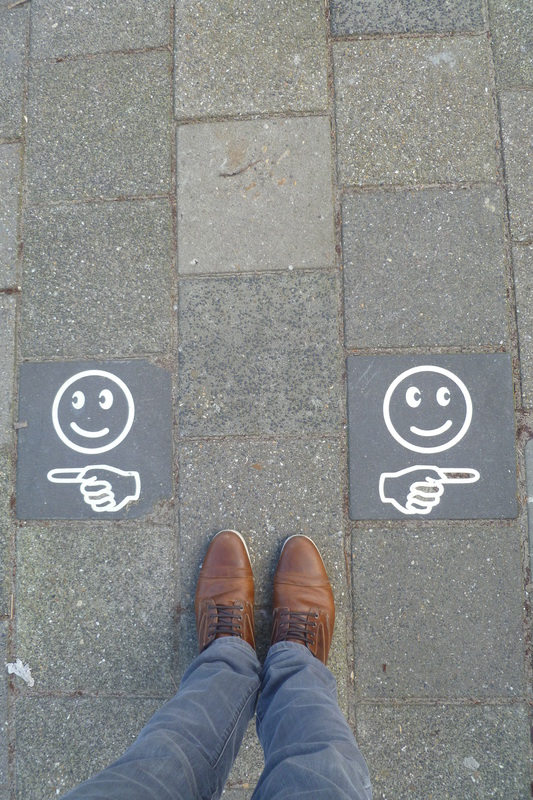 Take, for example, the inexplicable pavement art which thankfully points you both ways through life in the pursuit of happiness. 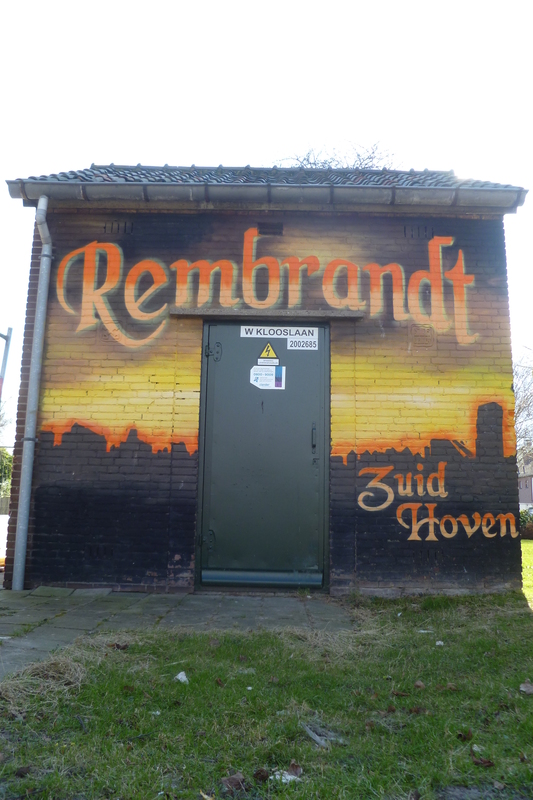 Some of the houses have decorative friezes with compelling Dutch poetry, others have large and colourful pictures that, were I betting man, look as if they have been produced by local school children. There’s a really different, far more every-day mum, dad, and the kids community out here on the fringe, and it’s evidenced everywhere you look. The further I ventured through this wonderfully kitsch world, the more I came to appreciate the fact that we forget about these places behind Leiden’s much-lauded highlights. I came to like a bit of grunge and enjoy the fact that I was living a more local lifestyle, even if it was just by going to the supermarket. 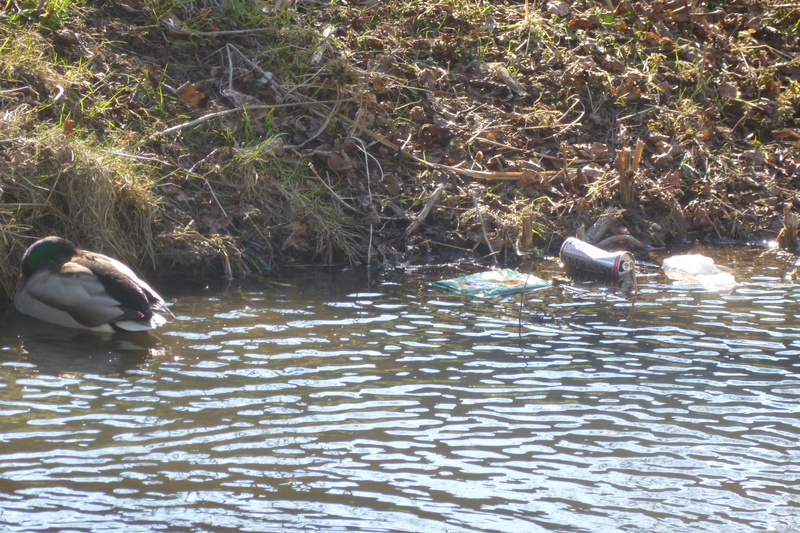 The canals out here aren’t spotless (actually, they’re not that great in the centre sometimes! ), the streets aren’t as wonderfully bedecked with red-brick and cobblestone. It’s not worthy of a postcard, but many people who live in and love Leiden as their own are to be found here. And me, with my backpack and camera in hand, felt like the first person to document this strange ecosystem, a bizarre and unexpected privilege. And then, all too suddenly, the landscape broadened out, and the concrete jungle gave way to a whole new monster. I had found my way to my destination, the juggernaut of all supermarkets in Holland: Albert Heijn XL. Want to learn more? I’m sorry but you’ll have to avidly wait for part 2! Are the hippychick carriers that safe? I read about several instances when parents were dropping the youngster utilizing the carrier, not sure whether thats the parents fault though. This entry was posted on February 28, 2013 by admin@theleidener in Culture, Leisure and tagged Albert Heijn XL, Art, behind the scenes, culture, Eric, International, Red Bull, Student, supermarkets, unknown.